eeep i would take the $150 any day! ive been looking for a shoe like that.. i need to search harder for a cheaper one! budget budget.. I just could never see myself in shoes that expensive. These are lovely. I'm glad you found a cheap find on these. Absolutely gorgeous! Such a great find on the cheaper version. i like the colour of the not too coy ones better, so tightwad it is! Oooooh I actually like the color of the Not Too Coy wedges better ~ great find, E! givenchy ALWAYS makes me think of Audrey Hepburn. always. Great style for a steal! I love these .... both! I mean, who wouldn't want a pair of Givenchy shoes? but in this case I can be as happy with the 'Not Too Coy' ones. Ooh, those are really cute! I guess the cheaper ones would work for me. I love these shoes! They're gorgeous. 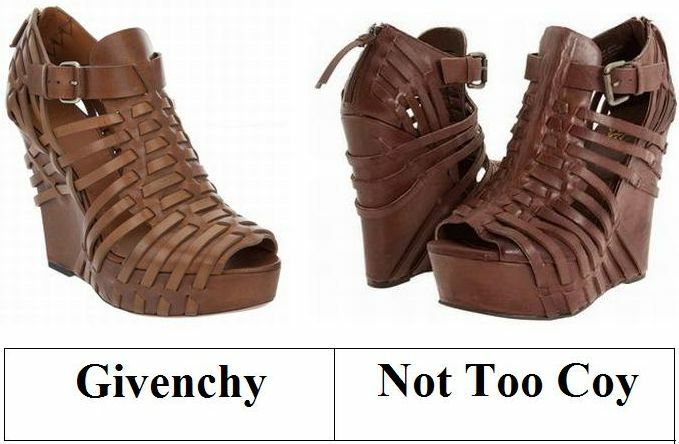 Really love the Givenchy pair. So cute! I've been looking for shoes like these! Love the Not Too Coy wedges! I like the lighter hue, even though the shoes themselves are not quite my style. That is a pretty good knockoff! I never understand how these budget brands can get away with copying more expensive designs that shamelessly, but hey... works for me. Great find! They are so similar!I think the second pair will be such a good deal! I like this style shoe, kind of sandal-y but with lots of leather. I'd like to try a pair of the Not Too Coy! Very nice find! Definitely would take the $150 pair! Super cute -- I'll take the cheaper pair any day! Ok, have you seen Last Friday Night, Katy Perry's new video? Youtube it. You'll crack up! the Not Too Coy pair have my heart! Oh my gosh these are great for summer! hello..this leather sandals are so cool for women.it can gives them very stylish look.